You do this by making "I" statements that describe what you want and need; Use that gentle start up to replace the criticism you've previously used against your spouse. When someone is criticized they no longer hear your compliant, but get defensive instead. When that happens no problem gets solved. You can repair your relationship after a fight by talking about how you feel, calming down, saying your sorry, agreeing with your spouse, saying you want to stop, and letting your spouse know what you appreciate about them. You'll need to do all of these steps are a combination of them to get the best benefit out of it. This is best done by deep breathing, squeezing and relaxing your muscles and visualizing a peaceful place. This is a skill that must be developed for you and your spouse to successfully make progress concerning problem solving. Conflict resolution isn't about one person changing, what it's really about is negotiating, finding common ground and ways that you can accommodate each other. Remember marriage counseling can help improve your ability to manage conflict. 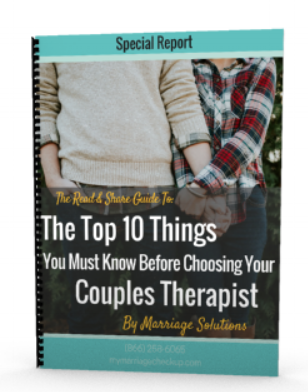 Too often couples wait 6 years after they need marriage counseling before they get the help they need.